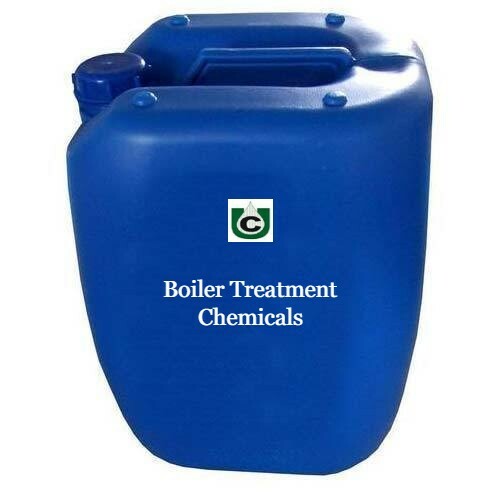 Universal Water Chemicals Pvt Ltd is a reputed Boiler Treatment Chemicals manufacturer & supplier from Hyderabad. These Boiler Water Treatment Chemicals will protect your boilers from various problems like Corrosion, Scale problems & intermittent shutdowns. Antiscalant, Oxygen Scavenger, PH Booster and Boiled Out Chemicals for your Boiler Treatment System. Universal Water Chemicals Pvt Ltd Boiler Treatment Chemicals are developed for all types of boilers relatively from low and medium pressure boilers to high pressure boilers used for power generation and process industries. To get more information on Boiler Chemicals, or to speak with a chemical representative about your Water Treatment System, call 7416079566 or fill out this Contact Us Form . ◈ It is suggested for Medium pressure boilers to control hardness related scale in the system. ◈ It is a (Phosphate based) liquid product, it react with calcium, magnesium carbonate salts and forms a sludge, which will go out through blow down. It is also helps to maintain alkali pH in the system, with its strong alkali nature. ◈ It is in residual phosphate reacts with Iron and forms a black magnetite layer, which protects boiler tubes from corrosion. It is suggested for Medium pressure boilers to increase the pH in the System. It is an inorganic pH Booster; it will helps in maintain alkali pH in the system. ◈ UNI CONDITIONER is a multipurpose boiler feed water chemical used for Soft water with high TDS. It is an ACRYLIC POLYMER based compound, act as a sludge conditioner and helps a scale free system. ◈ This will not allow all scale particles to stick on boiler tubes, and it keeps the scale particles in suspended form. This will come out through boiler blowdown as a sludge form. ◈ It is also effective on avoid corrosion in the system. ◈ It will maintain proper pH in the system. As it is a very active product it will help to decrease scale and corrosion in the system subsequently reduces maintained cost. It is in powder form and to be used only for newly erected boilers. It is phosphate based compound with alkaline nature. Since welding particles have been taken place inside the new boilers this compound should be used for sending out all particles from the boiler by giving (blow down ) bleed out. It is to be used in hot water up to tubes level. By using this compound boiler can be in safe zone. It is also in powder form and to be used only for newly erected boilers for neutralizing the system by removing all acidic contents from the inner side of the boiler. It helps the boiler to be kept in safe zone. Contact Universal Water Chemicals Pvt Ltd when your system needs a Boiler Water Treatment System Solution. From chiller cleaning chemicals to descaling chemicals, we have right mix of chemicals and solutions for you. If your system calls for additional water treatment, we can also help there as well. Call us at 7416079566 or contact us through our contact form and let us know how we can help you.